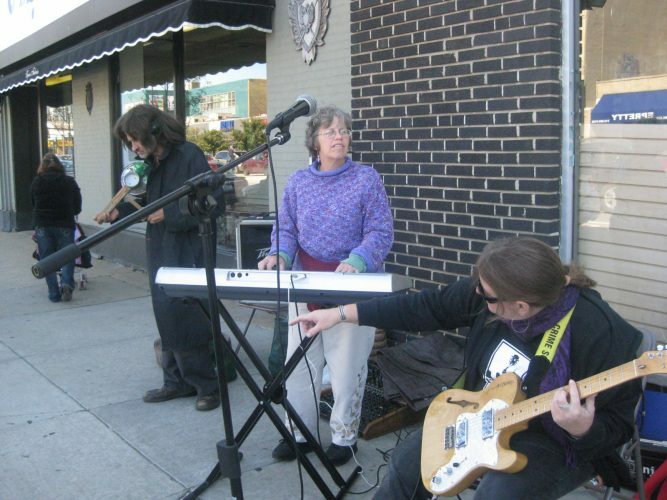 Performers (right to left) blueswomen Lori Lewis on guitar and Barrelhouse Bonni on keyboard, and activist Tyner White on his stradozuki perform at the going away party for the I Sachs Shoe Repair Supplies Store on Sunday, April 26, 2015 on Roosevelt Rd. at Desplaines, just east of Maxwell Street. The group played Maxwell Street style by performing on the sidewalk, and plugging amps into the store’s electricity. I Sachs Shoe Repair Supplies Store was the last Maxwell Street style business to relocate from the Maxwell Street area. All images published by the Maxwell Street Foundation within this website are copyright of the artist and are for educational, personal, and/or noncommercial use only. For any other use, please contact gro.n1555620601oitad1555620601nuoft1555620601eerts1555620601llewx1555620601am@of1555620601ni1555620601.